From the moment that first artwork arrived showing the white, nationalist cult/militia bad guys, we just knew Far Cry 5 would face controversy. A few days ago, a Change.org petition called ‘Cancel Far Cry 5’ went up. The racist nature of the piece has garnered a lot of attention, but the whole thing is almost certainly a satirical hoax. Like the previous Far Cry games, this open world shooter sees the player face off against some angry locals. But unlike the earlier titles, which are set in exotic locations like the Himalayas and Africa, this fifth entry takes place in the US state of Montana. Portraying gun-loving pseudo-Christians as the bad guys hasn’t gone down well with certain people, so hearing that a petition had been started by what appeared to be far-right conservatives wasn’t all that surprising. Reading the first few lines, the hateful rantings look real enough. It uses terms like degenerates and miscegenators, and even mentions Gamergate. But when listing the “crap” that gamers have had to endure over the years, the author includes: “the continued rejection of romantic partners when they find out our hobby.” The next paragraph references that great philosopher, Boltaire (yes, Boltaire), which seems like more than just a typo. Moreover, the quote itself is probably not from Voltaire, but from white supremacist Kevin Alfred Strom. There are also suggestions to change the setting to Canada, the antagonists to “inner city gangs” or Muslims, and throw some “blacks” or “Mexicans” in with the bad guys, along with threats of “violent repercussions” to Ubisoft if they fail to change the game. While there are plenty of people who hold these sort of racist beliefs and aren’t afraid to express them, it’s very hard to believe that this petition came from such a person. 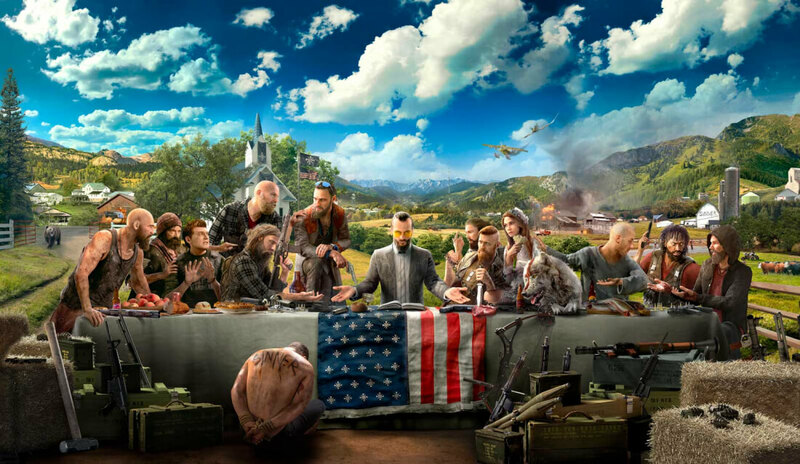 Interestingly, Ubisoft has since released an expanded version of the original poster (top) showing a black member of the cult (sitting second from right). A game about routing a Muslim cult would actually be pretty edgy. Agnomen and psycros like this. "Portraying gun-loving pseudo-Christians as the bad guys hasn’t gone down well with certain people"
Why create controversy where none exists? I see 10000 more comments saying "lol conservatives so butthurt" than I do comments that even acknowledge a possible controversy. liammac002, TomSEA and psycros like this. Well, this very picture in itself is clearly the Last Supper parody. I had to look up "miscegenators." Their what George Jefferson would have referred to as "zebras". I grew up in the country, this game looks awesome! Everyone gets offended so easily now, bunch of soft millennial pansies. Isn't that the premise of a couple CoD/'modern shooter' games, or did I miss the sarcasm? I signed it 5 times and didn't need to show any ID. -___- I hope Ubisoft doesn't pander to all these overly sensitive morons. They ruin everything. It's not. No AAA studio on the planet has the balls to make a shooter where you kill Koran-thumping jihadis. Closest they've come to that was back in the early to mid 2000s with "terrorists," and the premise had little to do with Islamic conquest. Those were all themed around would-be dictators and murderous dissidents. EClyde and USAvenger like this. Not just edgy but also very popular. When it comes to making moolah, why take any notice of some peoples sensitivity? To hell with them, just go ahead. Well I have heard some fellow Montanan's basically more excited the game is set here then anything else. I bet if the local news picked up what the game was about and ran some stories the old folk would get pissed, but that's all they seem to do anymore so who cares.